For a quick review, here is part one. 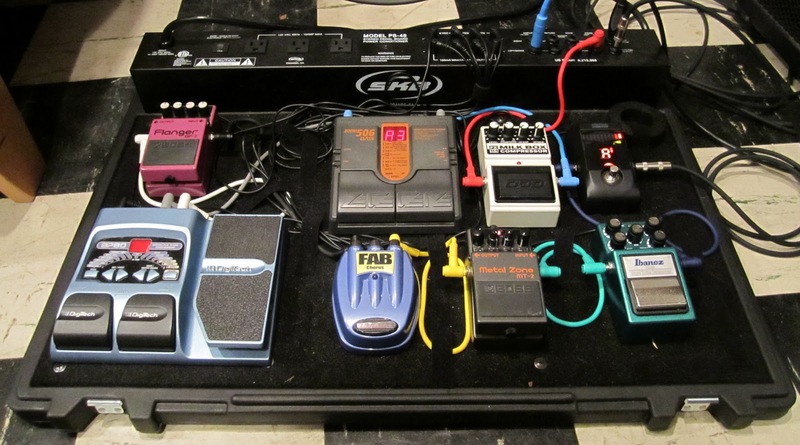 Now on to the rest of my pedal board as it stands now. 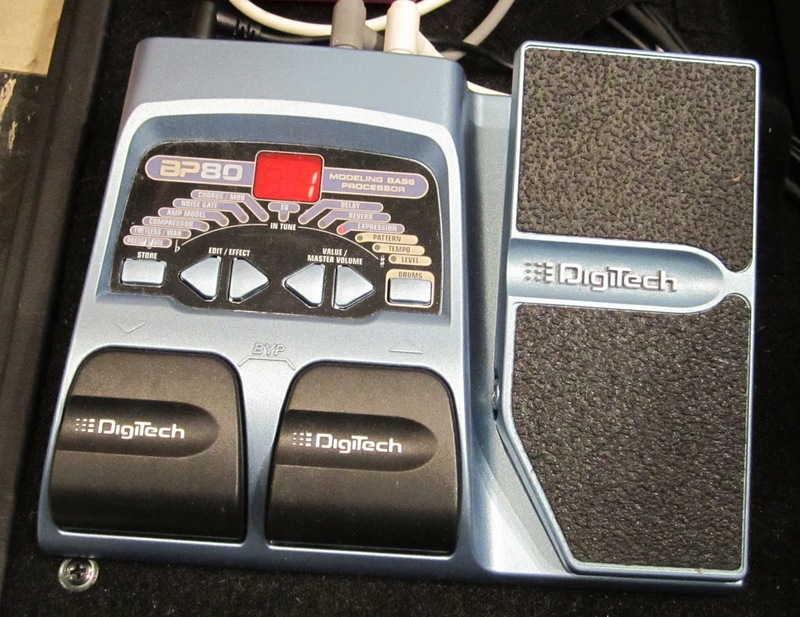 I normally use this pedal as an auto-wah type envelope filter. It is a lot of fun to mess around with and can do a lot more. It also has an octaver as one of its effect types, so I could see trying this out in the #2 slot as a dedicated octave pedal as opposed to an envelope filter. 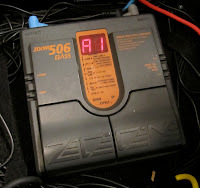 I have this acting as a volume pedal since I don't have a dedicated volume pedal up front. One tap away it is set up to change into a wah pedal. And then it does every other crazy thing that a multi-effect does. It could easily be set up to serve as a reverb or delay, should the need arise for any particular cover tune that might require it. This is one I can't live without, and I have it doing something really boring. Program one is nothing. I leave it there when the song I'm playing wants more boom and less attack. 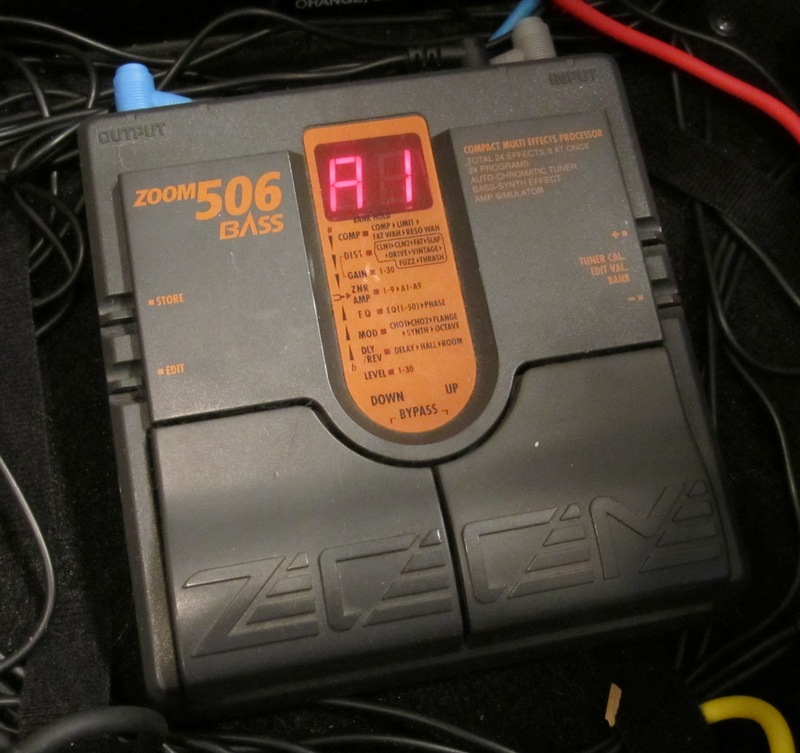 Program two is nothing but a "fat-wah" effect that is supposed to be controlled by an external pedal. 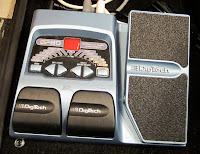 I don't have the external pedal, but what it ends up doing is adding an emphasis to the pick attack. Program three is a low mid boost added to the "fat-wah" effect which gives the bass even more of a cutting edge. I'm not sure what type of effect could replicate what I'm doing with this pedal at the moment. Perhaps an EQ pedal? I got this pedal to learn about compression. 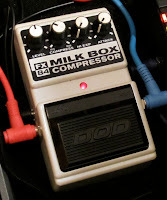 The article I used as the basis of my foray into effect pedals recommends a compressor at the end of the chain to add back in any life that was sucked out of your signal by running it through a bunch of little electronic boxes. I still am no compression expert, but basically it adds gain and sustain. I leave it on all the time. Everything is mounted on an SKB PS-45. The board was a good investment. I probably would have spent what it cost in 9-volt batteries by now. 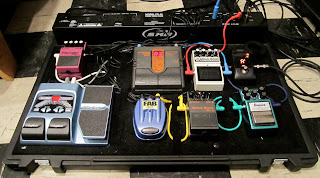 So there is the first generation of my pedal board. I deviated from the article at almost every turn, so it ended up treating it more like a guideline than a rule. I think that tuner up front, compressor at the end and overdrive before other tone-shaping effects are all good things to keep in mind. I'll probably start rethinking and tearing apart my board now that I've been playing with it for the better part of a year. I have a pretty good sense now of what I do and don't use and what type of effects generate the kinds of tones I'm looking for. I hope I've helped someone learn something.